I decided against. No one in their right mind could claim that this whole exercise is actually going to attract anyone to vote for or join the Labour Party, or so I thought. In the (unlikely) event that there is a real ‘Paul” and he is of sound mind. he is in for a terrible let down about Labour’s internal democracy. No Labour Party members, in practice, have any say on anything that goes on in their party, and you can be absolutely certain that neither will “affiliated supporters” or “registered supporters“. They may occasionally be allowed to vote in a leadership election, but that’s where it will stop. In 2010 (when there would have been just two candidates with the 15% threshold agreed yesterday, both called Miliband), I voted for the Miliband that carefully positioned himself at some distance from New Labour. What I got was this week described by a leading Blairite as “more Blairite than Blair on party reform“. Dig the Leader out of a hole of his own making. On the basis of a report about Falkirk which, as of yesterday, we can finally read ourselves, and which his advisers either lied to him about or didn’t read as closely as they should have and the Guardian now has, he made a bunch of foolish promises which could still bankrupt the party. Ensure that the trade unions never regain any influence in party decision making. Today’s proposals will, within five years, if all goes according to plan, tie union affiliation levels to the very much smaller numbers of those who will now have to jump through not one but two new hoops: first to “make a positive individual choice over the payment of affiliation fees to the Labour Party“, and then to “choose to formally support the party on a direct personal basis“. Only then will they become “affiliated supporters” but the two tier hurdle will ensure that affiliation levels plummet, and unions current votes and representation levels will become unsustainable. “Registered supporters” of the party will be put on a more sound basis, paying a fee, of about £3 (though it is unclear whether this is annual or a one-off sum), they too will have to make a declaration of interest/loyalty and be on the electoral register. Anyone previously registered in what Peter Hain once described as a “huge opportunity” for the party will simply be deleted from the records if they do not register afresh. The threshold for valid nominations of leadership candidates is reduced to only 15%. The parliamentary party succumbed to pleas based on the claim that “every union had signed up to the package” – we shall see how true that is on 1st March. Spending limits for “third parties” in parliamentary selections will be reviewed. The real problem here is with enforcement, especially in relation to party-within-a-party Progress bankrolled by Lord Sainsbury. Andy Kerr of the communication workers union took great exception to affiliated trade unions being described as “third parties”. After all the TUC had resolved in 1899 to found what became the Labour Party “with a view to securing a better representation of the interests of Labour in the House of Commons“. The only primary will be in London, not much consolation for Londoners, but reassuring for those who might otherwise have faced a primary for other mayoral elections or for parliamentary candidates. the effect will be that, because it will only be “registered affiliates” who can vote, not all union levy-payers, the union share of the voting will plummet from 50% of the electoral college to a fraction of that. The administrative problems have not been solved and financial ruin is still a distinct possibility for the party, but at least there will be a “continuous, permanent review” of implementation and the effect on revenue by the party’s business board. Ed Miliband has delivered on his misguided promise. He has clambered out of the political hole he dug, but Labour still faces possible financial disaster just before the 2020 general election. And what of the democratic gains? Some may see theoretical benefits in positive choices being made. An alternative view is that millions of trade union members will continue to pay a levy of perhaps £7 a year on average, almost all of which will either be paid to the Labour party or used for its benefit. In the past they received a ballot paper in leadership elections and, if they were Londoners, in selections of the London mayoral candidate. Now most of them won’t. It’s called One Member One Vote. And the member’s name is Miliband. After Collins: how will the unions respond? I got Miliband’s ‘Big Changes’ email yesterday and laughed out loud when I read about ‘Paul’s story’. Then I got really angry. Because even if ‘Paul’ exists (I doubt it myself – which of course means Miliband is a liar as well as a fool), rather than stand up to his Daily Mail prejudice of the Party never having been democratic, and spoken about the history of it, the reason why the unions needed to found it, and the democratic nature of the union vote in internal elections, he just accepts ‘Paul’s’ misconceptions and appears to be saying that for the FIRST time the party will be democratic (which of course is another lie in more ways than one). And the published Falkirk ‘report’ did make interesting reading didn’t it! How could anyone who claims to be an ‘investigator’ cobble together something that contains such serious allegations but without either evidence or even interviewing the two people that these allegations are against and will likely harm? As a TU rep I would have destroyed a report like that and the people who wrote it in a few minutes if an employer had been stupid enough to try and use it against one of my members in a disciplinary. But what does Miliband do? Call the police (the police!) and start us on this road to uncertain future funding and fudged internal election and membership changes. Meanwhile one of the two people who he publically slandered got sacked as a direct result and a key workplace has now got seriously weakened union power inside it. I’m still waiting for Miliband to apologise for that, but of course that would take some courage and principles wouldn’t it – qualities that the eejit shows time and again that he lacks. The sum will be yearly it’s the levy that labour are after, they once asked Jack Straw to look into the levy to see if he could force the Unions to pay this up front in total. Labour has been demanding the levy be paid in full with no reduction for many years, they once even tried to get unions which had disaffiliated to pay it saying the people that paid it were in fact labour party members.. This whole plan was to force this and to see if labour can get people to opt in, somehow I doubt to many will. I know I will not. I mean for god sake what has the labour party done in the past thirty years for unions except slam them and demand money. Its rather like asking: What did the Romans ever do for Britain? Well quite a lot really. It gave the TU’s a political voice, and representation in Parliament, and saved them from being completely decimated by Mrs T and Winston Churchill. Your right about one thing. If Paul doesn’t exist, and I expect there are a lot of tabloid journalists on the case right now, and it can be proved, then Milliband is in trouble. This sounds all badly thought out. What is happening is inevitable. Labour is turning itself into a social democratic party and the future is state funding with individual membership. Levy payers/affilliated supporters are gaining nothing(and in 2015 in London mayor election, levy payers are likely to lose a lot compared to the present situation)and they will be paying £3 or more every year and yet be treated the same as registered supporters who will pay less.Members of armed forces/former members can pay £1 and become full members.So levy payers are being treated as second class citizens in a party that the TUs set up. Agreed, reading the finer print from the Guardian, to affiliate under this scheme provides nothing more than the union members get today. This is all about *removing* rights from those union members who don’t tick the right boxes. Could Swantantra please give examples to illustrate the reply to the question about what the Labour Party has done for the unions in the past 30 years? I thought Churchill died in 1965 and Thatcher left power in 1990 so that example is only just appropriate, if not necessarily factually correct. Could this be a another example of rewriting the history of the Labour movement? Perhaps Swantantra is related to Paul in some way. On the subject of Paul, there is probably no need to have a competition to track him down as he is probably due to appear in a sofa session at a Labour Party special conference some time soon; sharing his experience of the newly democratised Labour party with an audience of delegates who will have no opportunity to contribute their views. Why do we always allow this to happen ? Will the CLGA slate be altered after the vote of the lemmings and what of Ed as an instrument of social advance? Remember Extending Party Democracy when the lemmings of Labour supported Gordon’s Trojan Horse of reaction. ‘Timeo Gordanum et dona ferentem’ so I wrote and we went from motions to issues and then when the farce failed from issues to motions. Timeo Millibandum et dona ferentem and the sunami of new members is the wettest of wet dreams. O for a leader of fire that would frazzle the lemmings and give l,abour a voice of conviction. The issue today is which party would be better for hard working people, you do not hear labour talking about the sick the disabled unless they are hammering down, pensioner are now out of the calculations because well they are a cost and are causing labour issues over the beloved hard working people, not working class, just hard working people. 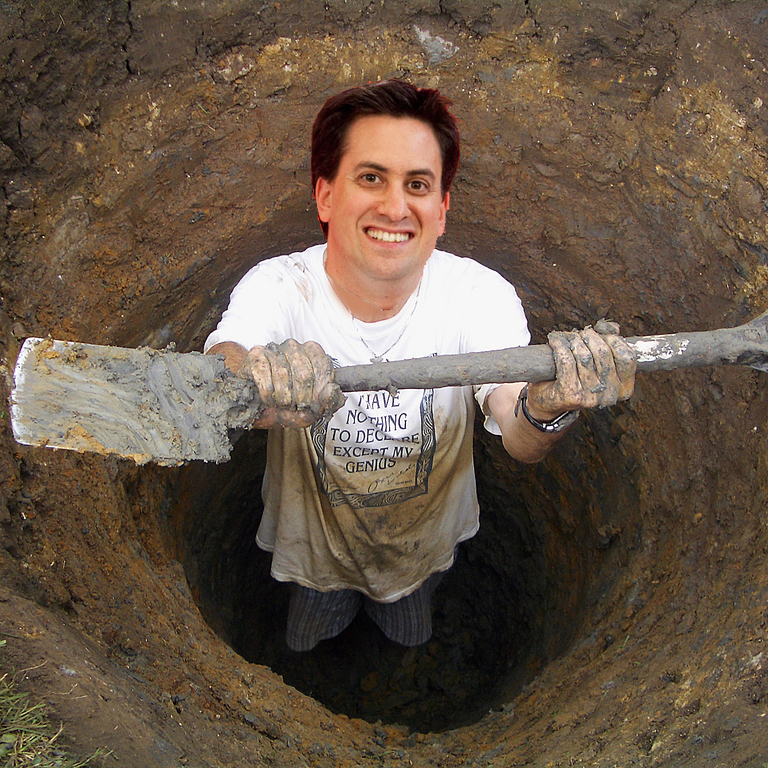 The problem is Miliband would not know hard working person if they fell on him. Will the labour party win the next election God I hope not, will the Tories god I hope not, and that’s the problem we have the Tories and the Tory Lite, lets hope UKIP do come second it might wake up these pratts.